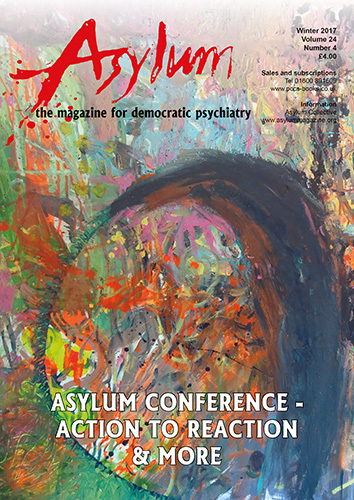 This issue has a focus on our public event – Asylum: Action to Reaction – in June 2017. We include most of the main presentations, some of the workshops, and some reactions – both positive and more critical. We take criticism very seriously. Within the bounds of civility, Asylum is a completely open forum for debate. So please let us know your thoughts on any matter, or suggest what you would like us to cover. In the meantime, among our plans for future topics (issues or part-issues) is to explore the question of companion animals and mental health. To contribute, on this or any other topic, get in touch.